Back in March of this year, we took a look at some of the best Apple Watch accessories that were already available. Quite a bit of time has passed since then – about 9 months – so it’s time we took another look at what’s out there. The best part about this is that it’s just in time for the holidays. We can all agree that the Apple Watch is pretty expensive, especially if someone wants it as a gift. 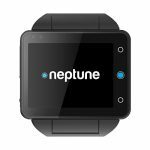 It might not be in your budget to actually give someone a brand new smartwatch, but you can certainly offer them something useful still. 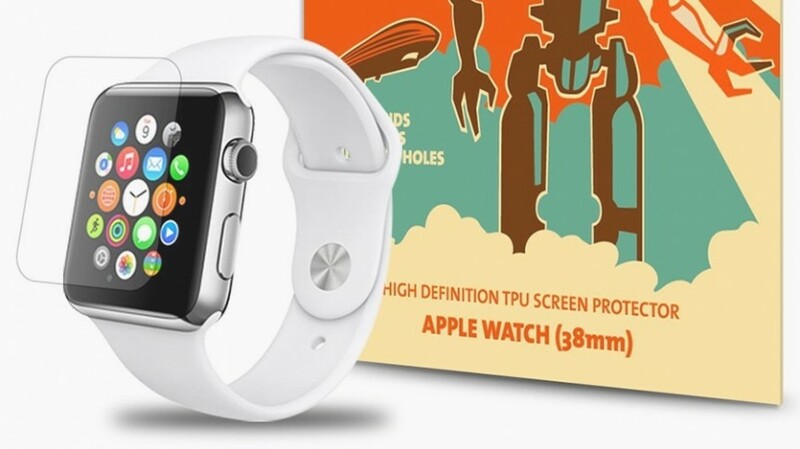 Any one of the accessories we discuss below would make a great gift for someone that already owns an Apple Watch, or will soon be getting one. 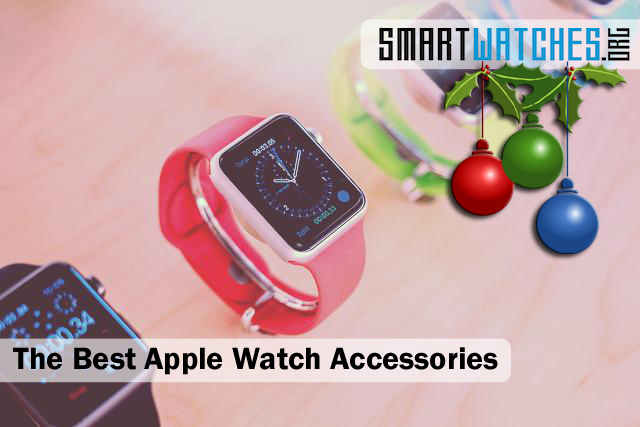 Even if you’re checking out this list with no intention to buy a gift, there are a lot of useful Apple Watch accessories listed so be sure to give it a read! 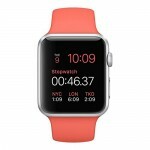 One of the most difficult decisions a new Apple Watch owner will face is what model they want to purchase, and furthermore what wristband – including the color and style – they would like bundled with their new watch. What might take away some of that guesswork is informing you that you can actually swap out the bands later. Yes, this means you can install a fully personalized band, and that’s exactly what Casetify specializes in. There are a variety of pre-existing strap designs and styles to choose from if you just want some ideas. Otherwise, you can upload a photo from Facebook or Instagram to have printed on a band. So, if you want a picture of your fluffy cat on your personalized Apple Watch band you can do that. After designing the band, you can also choose between the 38mm or 42mm size bands, which are the two different Apple Watch sizes that are available to purchase. 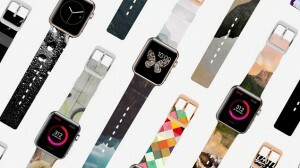 A customized band is $70 through casetify’s online storefront, and it comes with free shipping. One of the most frustrating limitations of the Apple Watch is that it only lasts for about a day on a single charge, less if you use it heavily. That means if you have a long day planned or you’re on a trip, there’s a real possibility that it will die on you before you can get to a charger. 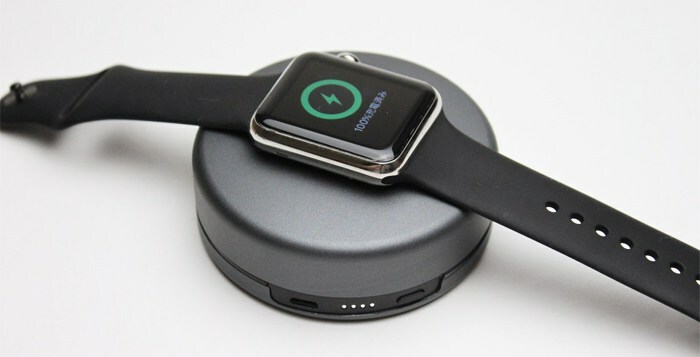 Luckily, the Nomad Pod is a portable charger designed specifically for use with the Apple Watch. 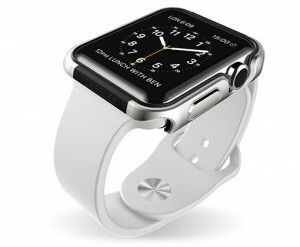 It includes a 1,800mAh battery which is enough to charge the Apple Watch completely a total of four times. Meaning, it can last you an additional two and a half days or so. You can just plug the cable into the micro USB port on the side and off you go, oh and the pod fits neatly inside your pocket. Don’t worry about lugging around the charging cable for your watch either, the pod conveniently opens up to reveal a compartment for the cable. You can pick up the Nomad Pod for about $60. 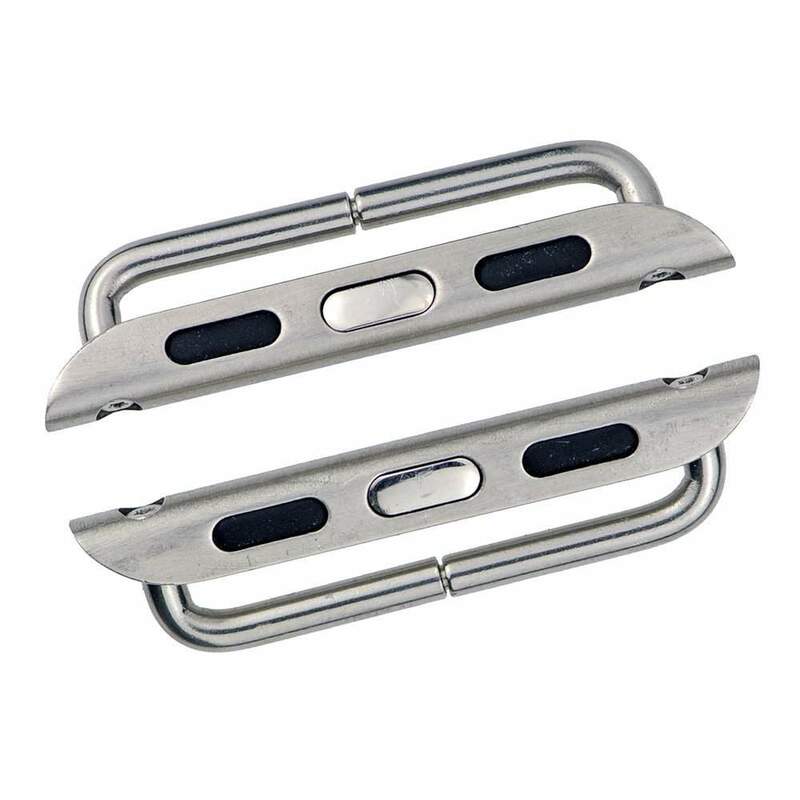 If you buy the Apple Watch Sport model you won’t get a stainless steel band unless you fork over the extra cash. The beauty of it is that you don’t actually have to buy Apple’s band, there are other options like the Hyperlink Stainless Steel Band which only costs $50 — it’s $300 cheaper — and is made of the same 316L stainless alloy as the stock bands. Sound too good to be true? Maybe, but go check it out. You can pre-order one now through Kickstarter. Let’s face it, you’re going to have to take off your Apple Watch every now and then. Maybe you even want to stow it away in your luggage during your flight? The WatchKeeper is a unique case designed for the Apple Watch that can hold the smartwatch, Magsafe connector and charging cable all in one space. You can also place your watch inside the case at the same time it’s plugged into the charger so it doubles as a stand of sorts. 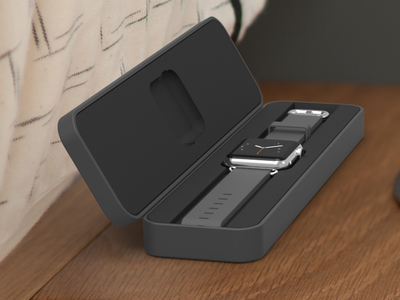 The case is designed with a steel unibody core, so your watch will be perfectly safe inside. The exterior is adorned with a leather finish that looks great. Your Apple Watch is pretty stylish on its own, so why not store it in something that looks and functions just as good? The WatchKeeper is about $60 through Studio Proper’s online storefront. It comes with free global shipping and a one-year warranty. Screen protectors are a dime-a-dozen these days. Problem is, most of them come in larger sheets and you have to chop them down to size yourself and apply them. It works much better — in terms of protection and usability — when you have a screen protector that’s been designed to fit a specific device. Mega Tiny Corp has created a screen protector for the Apple Watch. They promise edge-to-edge device and screen protection for all sizes: 38mm or 42mm. In addition, they claim it works great with Apple’s force touch technology. The protector also happens to be bubble-free, shatter-proof, and smudge-resistant. This particular screen protector can be purchased on Amazon for $6.99. Not bad at all. As an added bonus, the listing claims it can protect your device from “laser-shooting-robots and zombie attacks!” Phew, because we were really worried about that. Unfortunately, due to a recent software update for the Apple Watch, extended battery straps like the Reserve Strap will no longer work with the device. Want your Apple Watch to last longer than a day? Unfortunately, that probably means you’re going to have to take advantage of an extra power pack. That’s disconcerting because they can be both cumbersome and bulky. It doesn’t make a whole lot of sense to strap an additional battery pack onto a wearable device, especially if it makes wearing the thing uncomfortable. 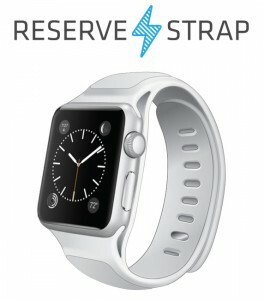 That’s why the Reserve Strap is promising. It’s a rubber-based wristband meant to replace the stock Apple Watch strap. Don’t worry, the device sensors will still work — which is important — and it will provide an additional 400mAh of battery power. As an early estimate, it should offer about another full days worth of use on a single charge. 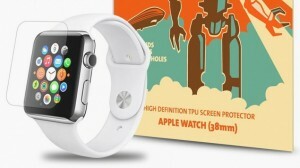 The biggest downside is the price at $249.99, which is almost the full cost of a new Apple Watch on its own. It’s also worth noting that the final product and design has yet to be chosen by investors. It won’t be available until sometime in 2016. You’ll probably carry your Apple Watch with you everywhere you go, but that doesn’t necessarily mean you’ll always be wearing it on your person. In fact, there might even be a moment where you don’t want to wear it yet still would love to bring it along. 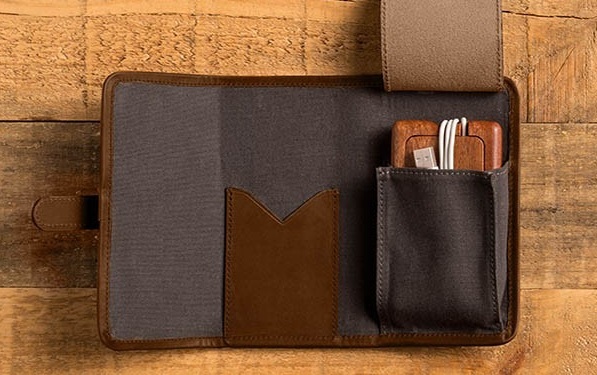 The Pad & Quill Roll Up Kit is a tailored American leather pouch, made just for transporting the Apple Watch and it’s necessities (read: charger). The interior is lined with a soft, linen material to protect your device from getting scuffed during travel. There’s even room for an additional strap — if you have one. If you want to splurge, you can pick up the luxury edition kit that includes a pocket stand and additional matching wallet. The base price isn’t too bad, starting at $49.99. It comes with a 25-year leather warranty, should something go awry during that time. The Apple Watch — no matter which model you choose — is hands-down one of the most expensive smartwatches on the market. Even though it’s been manufactured with premium materials, it’s still possible to scuff the thing up. While taking good care of your device is always important for its lifecycle, sometimes protecting it with a case is just as crucial — if not more so. That’s where the X-Doria Defense Edge is going to come in handy. 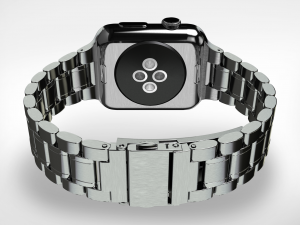 It’s an exterior case for the Apple Watch, made of aluminum on the outside and a soft rubber lining on the inside. It closes in around the sides of your device, protecting the bezel and edges from normal wear and tear, and potential damage. Believe us when we say, it’s pretty easy to knock your watch into things while it’s on your wrist. You can pick up a Defense Edge for both sizes — 38mm and 42mm — and it looks like the general design will mesh well with the various Watch models. To install the case, you simply snap it onto the Watch and that’s it! 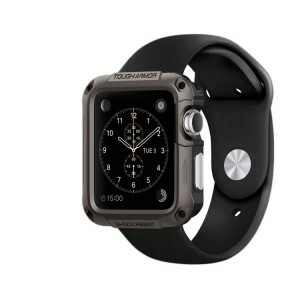 Talk about reasonably priced Apple Watch accessories, the X-Doria Defense Edge is only $29.99. If the X-Doria Defense Edge is too expensive for your tastes, or you just don’t like the design you can always opt for the Spigen Slim Armor instead. It’s a rugged case that protects the entire exterior of the Apple Watch from bangs, scratches, scuffs, and falls. It also comes with a pair of screen protectors which you can apply to the glass display. All the buttons and sensors remain open and usable even with the case attached, and it comes in two colors: white or black. The Spigen Slim Armor is available for $14.99 through the official store or via Amazon. Do you like to stick it to the man? Would you rather say “no” to Apple’s demand that you use their proprietary bands? We don’t blame you. 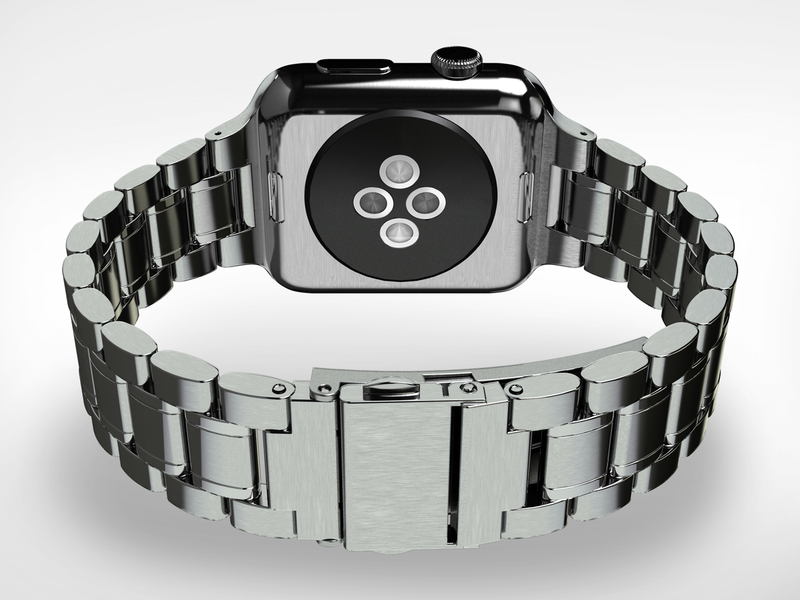 The LUVVIT stainless steel adapter is a unique buckle that lets you use any size band you want with the watch. That means if you already have a watchband from an old watch that you miss, you can hook it right up. It only costs $14.99 through Amazon. How’s that for sticking it to Apple? 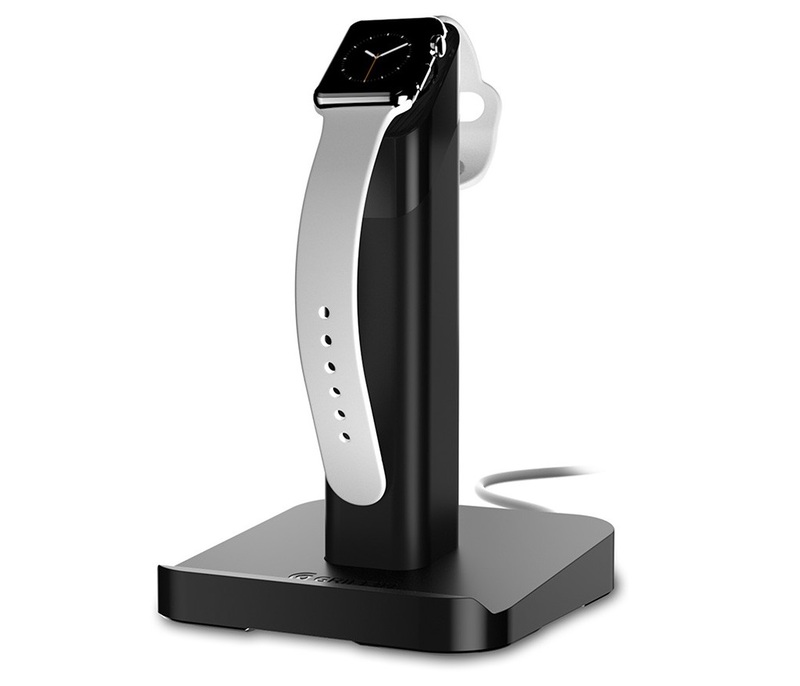 If you want a dock that’s actually going to let you display your Apple Watch in a more visually appealing manner, the Griffin WatchStand is probably your best bet. It’s a tall charging pedestal designed specifically for the Apple Watch that will accommodate both the 38mm and 42mm size models even with the wrist strap attached. Essentially, it’s a husk-like stand that makes use of the device’s included charger. In other words, you feed the charging cable — included with your Apple Watch — to the top of the stand. When you place the Watch on top, it will connect to the magnetic portion of the plug and begin juicing up. 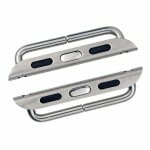 As an added bonus, there’s a section that will hold your iPhone too. Don’t worry, the Griffin WatchStand won’t empty your piggy bank; it’s only $29.99. Don’t forget there are always a variety of other accessories too that aren’t necessarily for the Apple Watch but would still work great. For example, there are a ton of awesome wireless headphones that would pair nicely with any smartwatch, smartphone or wearable device. In other words, you don’t need to buy Apple Watch accessories that were specifically modeled for use with the watch, there are plenty of other compatible options. Are there any Apple Watch accessories that we should have included on the list? Do you own any of these and would you recommend them?